When we first switched to a plant-based diet, faux cheese sauce became a very important part of our arsenal. We ate a lot of Mexican food (we still do) but it wasn’t the same without all of the cheese we used to add. After a few months we no longer craved the cheese, or faux cheese and rarely made it. It was just an extra step that we usually forgot. 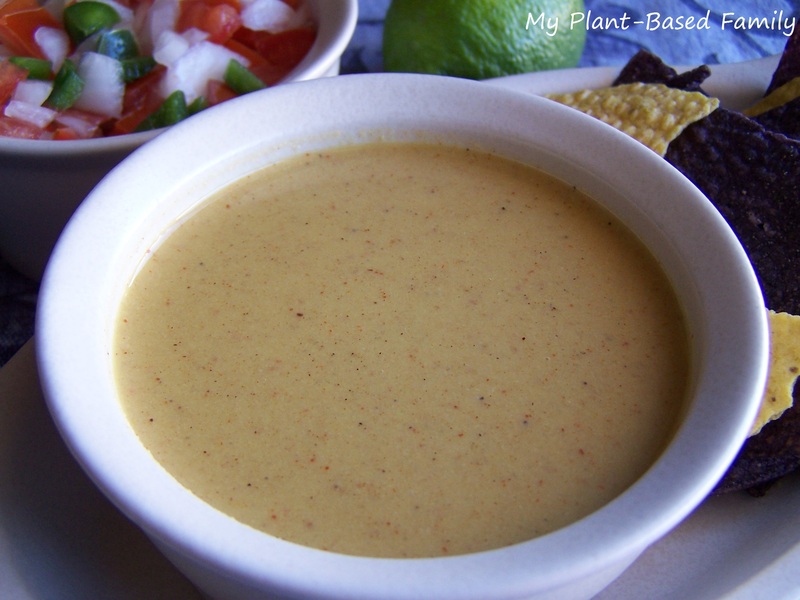 I love making faux cheese sauce for plant-based newbies. They are usually really missing their dairy and this really hits the spot. We don’t love it by itself but it’s great as part of the dish, I also don’t like tomatoes much by them selves but love salsa and tomato based sauces. *For a thicker sauce add extra flour. **These are optional but best used for a Mexican inspired flavor. In a medium sauce pan add all dry ingredients and place on medium heat. Stir with a wisk as dry ingredients are heated and begin to toast. Don’t let them burn! Once they are warmed and begin to be very fragrant (again, not burnt) add the plant milk and wisk often. Once sauce becomes thick remove from heat and let cool for a few minutes. We’ll have to try this! We miss cheese so much right now, well, I don’t miss Nate being sick!!! It is really easy, unless you walk away and it burns. I always make it last. I hope you like it. yeah, I will have to try this too. My boys love mac and cheese, I wonder if this would work. I’ll let you know. It should work. I plan to experiment with it more. I have made mac and cheese with a different cheese sauce recipe. I’m also planning a gormet baked mac and cheese too. You could even puree steamed cauliflower or baked potatoes into the sauce for a creamier version. I better stop talking before I give away all my secrets. Since you like a lot of mexican food, do you like red and/or green chile? It’s abundant here in New Mexico. I could mail some to you!! Makes everything better, and vegan of course! Email me your mailing address, it will be my treat! As long as you post a pic of what you end up making with it. If you ever need more let me know. I check my email almost everyday. Which do you think would work better, whole wheat flour or all purpose flour as a sub for rice flour? Janet, I think all purpose flour would work best. Let me know how it turns out. I have tried several cheese recipes, but this is my favorite! It is so easy to make and tastes great! Do you think/know if this would store well to use throughout the week reheated?